Nowadays Medzilaborce makes most tourist profit from the fact that the parents of the representative of pop-art Andy Warhol originally came from this town. In 1991 a unique museum, dedicated to the life and work of the world-wide known avant-garde artist, was opened there. In November 2002 a fountain with the statue of Andy Warhol was placed here in front of the museum. The author of the statue is the academic sculptor Juraj Bartusz. 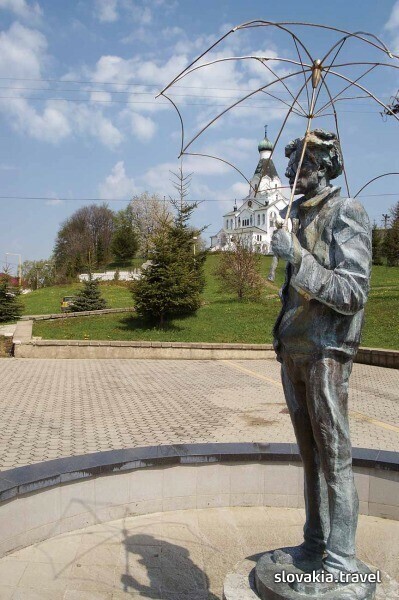 The statue in Medzilaborce, made of cast bronze, represents Andy Warhol with an umbrella, in his typical pose. The figure measuring 230cm in height is slightly relaxed and tense at the same time. The artist is hidden behind his glasses and in the imaginary shadow of his umbrella. As the first museum and art institution dedicated to Andy Warhol - a prominent personality of the 20th century art and the king of pop art - it is devoted primarily to the presentation of the works and life of Andy Warhol. During the World War I hard fights took place in eastern Slovakia, the region to which the good soldier Josef Švejk from the famous novel by Jaroslav Hašek was sent. The destroyed villages were newly built and the dead were buried on several military cemeteries. The Greek Catholic wooden church of St Michael the Archangel from 1777. The log building consists of three parts. Iconostas is from the mid-18th century, some icons are from the 17th century. Iconostas is a wooden polychromatic architecture with four rows of icons and tsar gate ornamented by woodcarvings and paint. It is from the mid-18th century. Some icons (Mandylion, St Michael, St Nicolas) are from the 17th century. The church was completely restored in 2001. The Greek Catholic wooden church of the Protection of the Most Holy Mother of Godfrom 1938 was built to the design of the Ukrainian architect and researcher involved with popular architecture V. Sichynsky. It is a typical structure of Boyko type, one-nave log building standing on taller masonry. The interior decoration is from the time when the church was built, but its iconostas is from the 18th century. The Greek Catholic wooden church of Sts Cosmo and Damian from 1924. It is a three-space church with a three-tier tower. The interior of the church and iconostas are from the time when the church was built.